In mid-February — February 17, to be precise — aspiring candidates for the May Primary election will be canvassing our neighborhoods and possibly stopping at your home for your registered voter signature and address on what is known as a candidate’s nominating petition. If you aren’t familiar with this kick-off election activity, here’s the scoop. The nominating petition is the first legal step in the election process for aspiring Primary candidates. This is where it all begins for a potential candidate. The nominating petition is a legal document and must be completed accurately and truthfully by the candidate, designated helper, and those signing the document. The nominating petition can be — and often is — scrutinized by county voter services, an opposing potential candidate, the press, and the public for validity of a registered voter’s legal signature and address. Since the nominating petition is a legal document and must be notarized by an aspiring candidate to insure its validity, signatures and complete addresses (no abbreviations like “W.B.” instead of writing “Wilkes-Barre”) are imperative. An error or omission can cause a voter’s entire nominating petition to be disqualified. If you aren’t sure about your voter registration being correct or current, or know that it isn’t correct, then don’t sign the nominating petition. 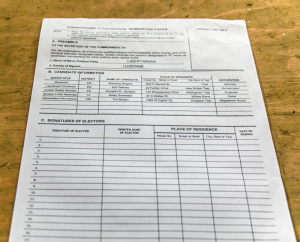 Note that a “signature line” includes a number of pieces of information in addition to the actual signature, such as the street address already mentioned and the date of signing. 2010 Libertarian nomination paper listing several candidates. This is less common with Republicans and Democrats. 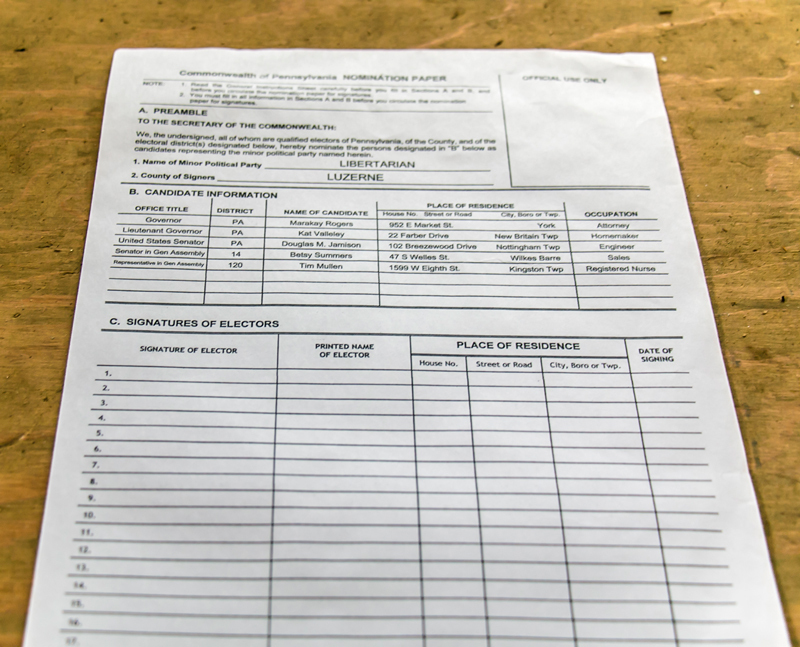 Every registered voter signature and address is considered a precious and essential treasure by the candidate on account of certain constraints, such as the petition deadline date for signatures and the winter weather of Northeastern Pennsylvania with which they must content during the three-seek petitioning window for major party candidates. Accuracy in completing the nominating petition is essential. Potential candidates often contact registered voters by phone or email to set up a time and date to acquire signatures, which makes the activity easier for both parties. If you plan to support an aspiring candidate for the May Primary ballot by signing their nominating petition, know that the petition cannot be circulated or signed by a registered voter before February 17 this year. The aspiring candidate has exactly three weeks to acquire a certain number of valid petition entries before the petitioning deadline. That number varies by office being sought, with some local seats require 5, 10, 25, or more signatures, and some requiring hundreds. In most cases the circulator will obtain many more signatures than is required to ensure that they are not disqualified from the ballot on account of incorrect signatures/addresses in what is know as a petition challenge. Believe it or not, with just 10 or 25 qualifying signatures a citizen’s name can actually appear on the May Primary ballot. Nominating petition for all elected offices, ranging from ward constables, poll workers, city council, city controller, mayor, school board and so on, right up to the office of the President of the United States. Petitioning can be a daunting, time-consuming task, so while some aspiring candidates seek registered voter signatures on their own, other candidates will enlist family, friends, and supporters to petition for them. Do read the nominating petition prior to signing and make sure that it is fully completed, indicating whom you are nominating and who is handing you the petition, also known as the circulator. The nominating petition header should list the name of the potential candidate, the office they seek, and, most importantly, the political party with which they’re affiliated. Never sign a blank nominating petition or a petition that isn’t fully completed. If you have questions about a candidate’s nominating petition, you may contact your local voter services. In Luzerne County that phone number is (570) 825-1715, and in Lackawanna County it’s (570) 963-6737. Ask for identification before opening your door to anyone, as should be your standard practice, even if the candidate or the person exhibits a name tag attached to their coat. You can sign a nominating petition on your porch if need be or at an event where nominating petitions are often circulated. If any area on the nominating petition is blank be sure to question the person circulating the document because, again, you are signing a legal document. You are not to sign a nominating petition for another registered voter at any address regardless of the reason. Anyone desiring to become a May Primary candidate or those who decide to sign a nominating petition to help get an aspiring candidate on the May ballot must be a registered voter, must legally reside at the address indicated on the nominating petition (which should also agree with the address appearing on their voter registration card), and must be a member of the potential candidate’s political party. If you do not legally reside at the address indicated on your voter registration you cannot sign “specific locality” nominating petitions. If your signature and address is found to be incorrect problems can occur for both you and the potential candidate, so be truthful. Both parties involved in the nominating petition signing should know and abide by the rules without exception. An example of a specific locality nominating petition would be the Wilkes-Barre City Hall elections. Only Wilkes-Barre residents who are legally registered voters can sign for those potential candidates, such as mayor, city council, and city controller. By contrast, school board nominating petitions may be signed by all registered voters residing within the service area of that district, such as the Wilkes-Barre Area School District. Nominating petitions are party specific, meaning, for instance, that a registered Republican voter can sign only for a Republican candidate. This same restriction applies to voters in the May Primary election. The November General election is open to any registered voter, who may vote for anyone who is listed on the ballot — or may even write in the candidate of their choice. Now is the time for citizens to check their voter registration and make sure that their information is correct. Your signature and address must be current in order to sign a nominating petition, as well as for voting in the May and November elections. Your voter registration card lists important information, like your legal name, address, political party, ward and the particular voting location for your ward. You can update your information and request a new voter registration card here in January by simply contacting your local voter services office by phone, email, or land mail for assistance. At no time should a voter accept money, gifts, or a promise for a job, contracts, etc. for their signature on a candidate’s nominating petition or for their vote at the polling location. Ethics matter in all elections. You live under the local government, school board, and beyond, extending right on to your state capitol and the White House . . . office holders whom you might be nominating and later voting for with your signature, starting in February with the nominating petitions. Be ever vigilant concerning our precious election process. Know whom and what you are supporting with your signature or your vote in the May and November elections because we are the government and we ought to elect only the most ethical and appropriate candidates to represent our needs and interests. Those desiring to circulate a nominating petition for an elected seat can contact county voter services for information or, in Wilkes-Barre, the Wilkes-Barre Taxpayers Association, either by telephone or online, at (570) 851-4336 and https://sites.google.com/site/wbctpa. Citizens who desire to register to vote can contact voter services in their own county. If you wish to become an elected official for all of the right reasons, know that you are needed, but be prepared to work hard for those precious votes and know that there are elected officials who don’t desire change as well as those who dislike being questioned or challenged. The political arena is, as we know, a bull ring and is nasty at times. Once elected, your entire life is open to scrutiny, as well as those of your loved ones. The responsibilities of an elected official in any capacity are definitely not for the faint of heart, especially in the midst of a history of corruption. If you can take the proverbial heat and promise to govern ethically, then do indeed take the dive! Lastly, if you know you cannot get to your voting (polling) location on election day because of illness, disability, mobility issues, vacation, military, work schedule or some other valid reason, please contact your local voter services at least one month prior to every election and request an absentee voter application. Voting from home or where you happen to be situated on election day is easy and valid. Simply complete the application immediately and send it to voter services. Your ballot then arrives in time for you to vote by mail. Return the ballot immediately (the next day if possible) so it’s received by voter services before the designated deadline. It is also important to note that some elected seats are paid positions while others are non-paid. The Wilkes-Barre City Hall elected seats, for example, are all compensated positions and offer a host of benefits including a pension plan, while, on the other hand, the Wilkes-Barre School Board seats are non-paid. Knowing what seats are paid and how much an elected official is being paid via taxation should be important to all. In Wilkes-Barre City Hall our mayor receives just over $80,000 /year in salary, four city council members receive about $1,350/month, with the chairperson, Bill Barrett, receiving $1,450/month. Benefits are taken at will by the city elected. Though elected seats — for example, those in Wilkes-Barre City Hall — are paid as full-time workers are, some elected individuals work other full-time jobs, are retired from the city, or are retired from private industry. The education level necessary for elected positions varies. You don’t have to be a lawyer or a college graduate to become a good elected official, but holding a college degree in an appropriate field or having expertise from a career is helpful. Knowing what each elected seat manages should be a good start in deciding who should be seated. For instance, a Wilkes-Barre City Controller seat should be sought by a math-focused person, accountant, or someone with experience in the areas of business and government.